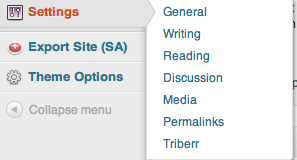 Inside Wordpress admin area, hover over "Settings" and choose "Triberr". It will ask you for an API blog token. Click on the Account drop down, then click "Settings"
Step 1: Inside Wordpress admin area, hover over "Settings" and choose "Triberr". It will ask you for a unique blog token. Step 3: Click on the Account drop down, then click "Settings"
Congratulations. You have successfully installed and setup the Triberr plugin. Your future posts will now be instantly imported into Triberr.